Being a professional punching tool manufacturer with leading techology, Tai Cheng always does the best for considering and fulfilling that customers' needs and demands. A wide range of punching tools produced and provided by Tai Cheng is for meeting diverse requirements in the compatitive marketing of hand tools. Tai Cheng punching tool is including hydraulic punching tool, ratchet type to punch, angle-steel hydraulic punching tool, double-hole type of hydraulic punching machine, light steel hydraulic tools, female wire processing machines and so on. Research and develop the handy, light steel type of punching tool to be easy to punch and reach quickness. 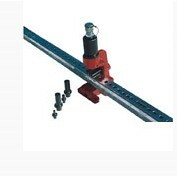 The materials are iron plate, stainless steel plate, angle steel and C type of steel 4mm; the max. hole diameter 13mm.